NAMM: Latest Music Technology . . . You Know, for Kids! 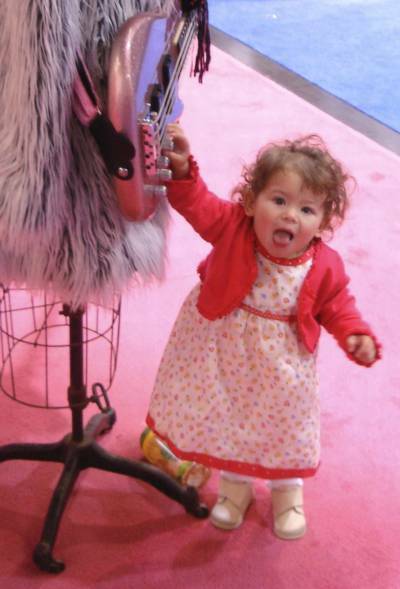 Children and young adults were everywhere at the NAMM show. They ranged from musically-inclined tots like the one shown here to teenage musical stars. And in addition to teaching musicianship and musical creativity, there’s a new emphasis on teaching them technology. Here’s a quick look at the latest efforts to bring music to a new generation of musicians. Music for Teens: There’s a big push to get more teenagers involved in music and technology, at a time when music education is slipping and tech is disproportionately embraced by a minority of players, most of them men. The John Lennon Tour Bus continued its nationwide tour by parking in front of the NAMM Convention Center and hosting teen songwriters and musicians, including some very impressive acts. (We all got to listen while we ate lunch — mmm, loved that gumbo and baked beans, by the way.) NAMM has its own Music Edge initiative to try to reach teens. They’ve put together a compelling Girls Rock section of that site demonstrating music doesn’t have to be a boys’ club, including some tech-savvy acts like vocalist Imogen Heap. (Imogen reveals in that interview her first love affair with an Atari computer for music.) And music manufacturers were assembling for another annual music ed summit. Music on TV: NAMM announced two initiatives to get more TiVo-able music programming. They’ll be underwriting PBS’ 30-minute piano primer The Piano Guy. (Hmmm, maybe I should be tuning in!) You’ll also be able to watch international drum corps competitions on ESPN thanks to NAMM. Most of us are too old — 13-21 is the age range — but at least we can watch from the local sports bar. These are just a few stories I picked up; I expect I’ll hear more now that I’m back. Heard any good news about involving more people in music, and teaching young people using technology? Let us know.